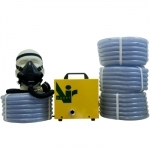 The HOBBYAIR HB01 Supplied Air Respirator System includes 40 foot hose and choice of mask for one user providing a constant flow of fresh air from a remote air location to a user in a contaminated area.. 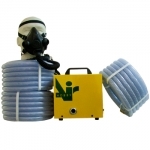 The HOBBYAIR 120 Respirator System is a one man system that provides a constant flow of fresh air from a remote air location to a user in a contaminated area. 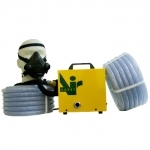 The HOBBYAIR 160 HB160 Respirator System is a one man system that provides a constant flow of fresh air from a remote air location to a user in a contaminated area. 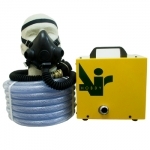 The HOBBYAIR HB02 Respirator System is a one man system that provides a constant flow of fresh air from a remote air location to a user in a contaminated area. 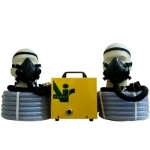 The HOBBYAIR BUDDY Respirator System is a two man system that provides a constant flow of fresh air from a remote air location to a user in a contaminated area. 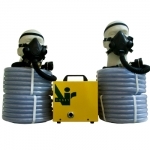 The HOBBYAIR BUDDY 80 Respirator System #HBBUD is a two man system that provides a constant flow of fresh air from a remote air location to a user in a contaminated area.